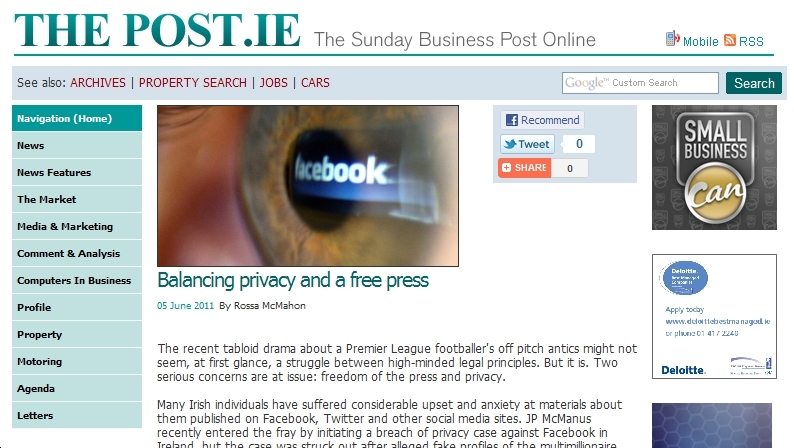 I wrote a short article for last week’s Sunday Business Post on the super-injunctions story and the conflict between freedom of speech and privacy. It appeared in the Computers and Business magazine and is available here. It’s a difficult topic to tackle in a short article and some more thoughts on the issue are in my earlier rambling blogpost. However, Karlin Lillington dealt with the issue expertly in last Friday’s Irish Times by contrasting the UK super-injunctions saga with the Irish experience of data protection and retention laws. PRIVACY HAS two definitions. There is the definition that applies if you are wealthy, or a celebrity, or a corporation or organisation, and you wish carefully to protect from the public eye your infidelities, personal peccadilloes, ethically questionable activities, illegal doings or other foibles that might damage your income, reputation or bottom line. Then, there is the definition that applies if you are just an ordinary citizen and a bank, an insurance company, an electronics manufacturer, a telecommunications company, a law enforcement agency, a government department or other organisation holds or would like to view lots of potentially sensitive information about you. If you are in the former, elite group, lucky you. You will find you are entitled to all sorts of perks and privileges when it comes to your special definition of privacy. Your national government may come up with laws specifically to protect your version of privacy. Justice systems may invent special protections that mean not only is no one allowed to mention whatever it is you or your company is said to have done, but no one is even allowed to mention that such a legal protection is there in the first place. Social media and internet companies may, despite public statements about valuing their users and freedom and democracy, relinquish information about the people who might have said something annoying about you, your company or your government, the better to enable the justice system to get these aggravating people off your back. If you are in the second group, your privacy is too often a commodity.